NLC News: NLC Announces 2nd Annual Camp Richard Family Fun Day! 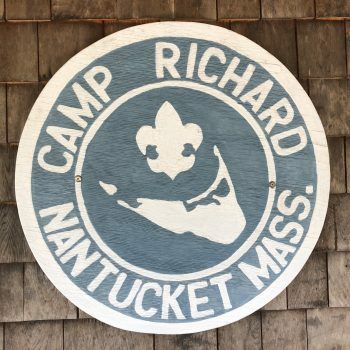 The Nantucket Land Council is proud to announce the 2nd Annual Camp Richard Family Fun Day! Enjoy the beautiful 100-acre Boy Scout camp and celebrate the NLC’s court case win to preserve and protect this land! 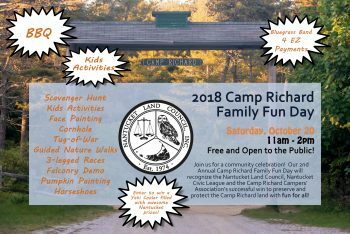 Free and open to the public, all are invited to enjoy a fall afternoon playing and exploring the grounds of Camp Richard. We’ll have live music with 4 EZ Payments, BBQ, guided nature walks, a scavenger hunt, camp games, horseshoes, 3 legged-race, pumpkin painting, pumpkin ring toss, and more! This event is open to all ages, activities are free and lunch will be available for a donation to the Nantucket Land Council. The NLC would like to thank the Nantucket Boy Scouts, Camp Richard Campers Association, and the Nantucket Civic League for their support of this event.